Whilst marching from Portugal to a position which commands the approach to Madrid and the French forces, my officers have been diligently complying with your requests which have been sent by His Majesty’s ship from London to Lisbon and thence by dispatch to our headquarters. We have enumerated our saddles, bridles, tents and tent poles, and all manner of sundry items for which His Majesty’s Government holds me accountable. I have dispatched reports on the character, wit and spleen of every officer. Each item and every farthing has been accounted for with two regrettable exceptions for which I beg your indulgence. Unfortunately the sum of one shilling and ninepence remains unaccounted for in one infantry battalion’s petty cash and there has been a hideous confusion as to the number of jars of raspberry jam issued to one cavalry regiment during a sandstorm in western Spain. This reprehensible carelessness may be related to the pressure of circumstance, since we are at war with France, a fact which may come as a bit of a surprise to you gentlemen in Whitehall. While it is important to ensure that taxpayers' resources are well looked after, the fog of war is always likely to result in some wastage and administrative discrepancies - though £6.3bn is quite a discrepancy! But I suggest that the even more important question is about the overall mission - the desired effect - rather than the flaws in the associated administrative processes. After all, what use is good book-keeping if you lose the war? See also Evelyn Waugh's letter to his wife about explosive military mathematics. 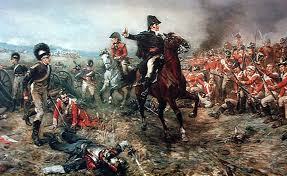 The 6th Duke of Wellington was killed in action while serving with No. 2 Commando in 1943. Thanks to Alex Jacobs of NGO Performance for reminding me of Wellington's letter.